It’s definitely a fun time to be a gin lover in the US. Several distillers across the country are producing new, exciting gins. I’ve tried most of the West Coast contenders, but my latest acquisition comes to us from Philadelphia: Bluecoat American Dry Gin. The distiller tells us they use a handmade copper pot still, using a slow heating process in their five batch distillations to maximize separation to reduce impurities. They use a secret blend of botanicals, including, of course, juniper berries and citrus peels. On first scent, this is a very clean gin, perhaps the least aggressively aromatic I’ve tried recently. I have to admit, I didn’t really enjoy it straight, but then, I don’t drink gin straight, so this wasn’t a huge setback. It does have a nice feel on the tongue, but I couldn’t quite place what flavor was disagreeing with me. The first drink I tried with Bluecoat was the Astoria. With Martini and Rossi Bianco, this was a very nice cocktail; I think I like it even better than with Junipero. Next I tried a Martinez. While it wasn’t my favorite Martinez of all time, it was very enjoyable. 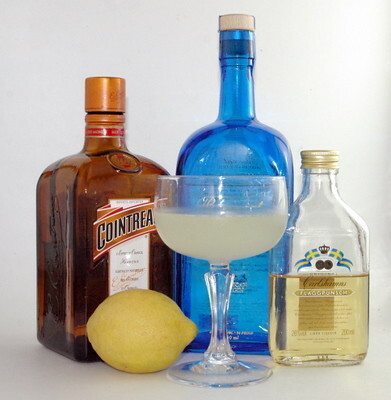 Tonight, I decided I would give the Corpse Reviver No. 2a a try. After reading about it over at the Underhill-Lounge, I suspected I’d really enjoy this use of my Swedish Punsch. And I was not disappointed. The Swedish Punch and lemon juice work really well together, softened by the Cointreau. Bluecoat gives a nice background accompaniment that accentuates the Swedish Punsch flavors. As always, the dash of absinthe is just enough to punch up the drink without distracting from the other flavors. I’m looking forward to more experimentation with Bluecoat. To my palate, it’s a quality product that will work well in most dry gin cocktails. I’ll be interested to hear what else you like it in. If you want more info, my new roommate is friends with the distiller.